When the Ernie Ball/BMW- designed Bongo bass came out in 2003, its innovative styling and brilliant tonal quality shook up the bass world. The four- and five- string models have garnered a rabid worldwide fan base; but now, with the introduction of the six-string version (the first-ever Music Man six-string bass), the Bongo is poised to carve itself a bigger niche. 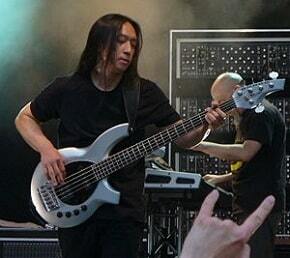 While not a signature model, the Bongo 6 has much to do with Dream Theater bassist John Myung. Fellow DT guitarist John Petrucci is a Music Man signature artist, and so it wasn’t a stretch that Myung would eventually hookup with the folks at Ernie Ball. Myung used StingRay basses early in his career, so in many ways this new ax is a return trip for him. Although Myung was not involved in the design stage, word has it that he liked the prototypes so much, he refused to let them make any changes. The Bongo mates a basswood body to a bolt-on maple neck with rosewood fingerboard. The board has 24 frets and cool half-moon markers, though I found the top two frets a bit hard to reach. The Bongo’s 17.5mm (just under 3/4-inch) string spacing produces a width of 3 1/2 inches at the bridge. This tapers to 2 1/4 inches at the nut, providing ample room for slapping without making things unmanageable for the fretting hand. The neck is wide and flat, but it has a comfortable rounded D profile. The fingerboard’s 11-inch radius is rounder than on most six-strings, evoking the curve of a four-string. However, I found this made for trickier B-string muting, and I had to arch my wrist more than usual to play fretboard-spanning chords, Of course, with a 34-inch-scale bass, the big question is, “How’s the B string?” Killer! My review instrument had a wonderfully articulate and robust B. The Bongo has a unique sonic signature, different from the StingRay and Sterling basses, but definitely identifiable as Music Man. The neodymium magnets have greater output than ceramic or alnico and give the pickups a clarity and immediacy that cuts through the thickest guitar goo. The HS (humbucker/single-coil) model has a four-band EQ, as does the HH model; single-H models come with a three-band EQ. The control layout has a master volume, pickup pan, a concentric knob for both low mids (400Hz) and high mids (2.5kHz) and a concentric knob for bass (100Hz) and treble (8kHz). The Bongo 6 has an authoritative edge to its sound. Even with the high end rolled off, it retains its bite, and the low EQ can bring in a swollen, cushy bottom end that will fill out the mix nicely. While playing the Bongo at a straight-ahead jazz gig, I found the front pickup delivered good tone for walking lines, while rolling back to the middle position on the pan pot provided the right amount of articulation for soloing. Emphasizing the bridge pickup gave the bass a tight, cutting tone that echoed the classic StingRay. However, I would prefer to see the low-mid control set in the 250Hz range for more girth. And, frankly, I’m not so sure I need a high mid control. When I had the opportunity to compare, I found I preferred the three-band EQ on the single-H Bongo, but it isn’t offered on dual-pickup models. The Bongo has a very clear and determined tone, one well suited to being heard in a crowded mix, a quality that is undoubtedly appreciated by Myung. On a six-string bass, good string-to- string balance and note consistency are critical. Happily, the Bongo excels here. The instrument has a convincing feel, and at the risk of sounding overly nationalistic, I have to say that there is something satisfying about playing a solid U.S. made bass. As a high-quality six-string bass with a bolt-on neck and 34-inch scale, the Bongo 6 represents an underserved niche in the bass market and it performs exceptionally well. Its modern vibe may not be for everyone, but I find the width of the six-string neck gives it a more balanced look compared to the four-string model. Ernie Ball Bongo bangers will undoubtedly want one of these to round out their collections, but the Bongo 6 has enough charm to bring new players into the fold as well. Thanks to Bass Guitar Magazine and Guitar World for the report!